Just image this, you’re walking through Times Square. Low and behold appears a Joe Bonamassa and Beth Hart billboard. Is it just dream? Not this time; it’s reality. Pictured above is a billboard from Times Square in New York City. Joe and Beth’s album cover was displayed in Times Square along with the release date of the album. 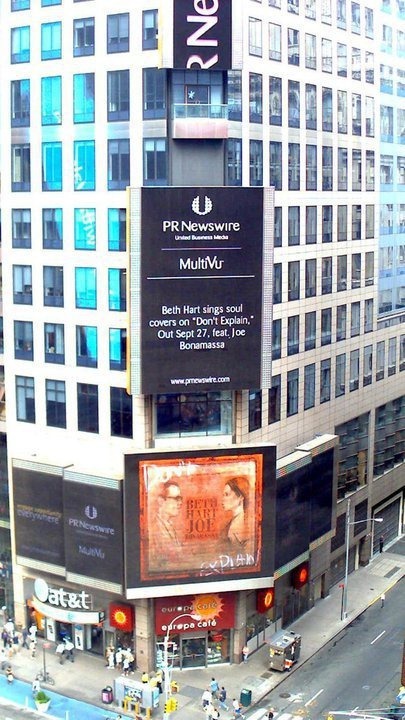 Both billboards advertise press releases from PR Newswire, which is the company that deals with Joe’s press releases. Many thanks to Lindsay (Joe’s sister) for taking this awesome picture. What a thrill just being in Times Square…and we’re so much looking forward to this release!!! My friends and I love your music. One friend has given you credit for helping her get through some very difficult times. Recently, we were all disappointed to learn that someone was posing as you and Jason Tyler on Facebook. Do you have a legit page or group on Facebook? We were heart broken to find out that this scam was taking place. We love you and your music, you are a great guy and an amazing musician. Thanks and keep the tunes coming our way.